Spectrum Flight Simulations in MiGMan's Flight Simulation Museum.
" The one which really sticks out in my mind from way back then was one that I found as a budget title for the Spectrum. The sim was based around the RAF's Lightning point interceptor. Although the graphics were wire frame and there were practically no ground graphics, the attention to detail, complexity, flight modelling and combat were unbelievable. I think the programmer had been a Lightning pilot. I remember managing to take off, intercepting an intruding Russian jet (Fencer? ), shooting it down and then landing in one piece and thinking that I deserved a major prize. After that I didn't touch it again because I knew I probably couldn't repeat it! Anyway, just thought I'd mention it. The other interesting thing was that it had a gun camera feature. " MiGMan thanks Mungo for remembering this classic sim. 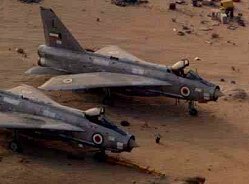 In it's day the Lightning had few peers. Unusual design features included the vertically stacked engines and overwing fuel tank mounts... yes, you read correctly.... OVERWING! Name corrected from "Spectrum Lightning sim" to "Lightning Simulator" and release date moved from 1982 to 1988.